The Shark Bite 1/2 in. Push-to-Connect x 1/2 in. Push-to-Connect x 1/2 in. Female NPT Slip Tee is used to connect copper and CPVC pipes. The Slip tee allows for the fitting to be inserted onto the pipe and then using the disconnect tool slipped back onto the other end of the pipe. This allows for up to a 2 in. section of the pipe to be removed and then repaired without having to add additional pipe. This slip tee is perfect for removing a section of pipe and adding in an expansion tank for your water heater, the FNPT Tee is threaded so you can screw in the Expansion tank after installing the tee to the line. Joins two 3/4 Inch Pieces of Poly Pipe to 1/2 Inch Male Threaded Pipe to form a reducing tee. NSF Approved. Safe for Potable Water. Good Chemical Resistance. Not affected by Ultraviolet Light. Widely used in irrigation systems where lines are not below the frost line. Temperature Rating 73 F - Cold Water Applications. Sb Tee Female Centre 1/2 Inch Fnpt Slip Rt Lf The Shark Bite 1/2 in. Push-to-Connect x 1/2 in. Push-to-Connect x 1/2 in. Female NPT Slip Tee is used to connect copper and CPVC pipes. 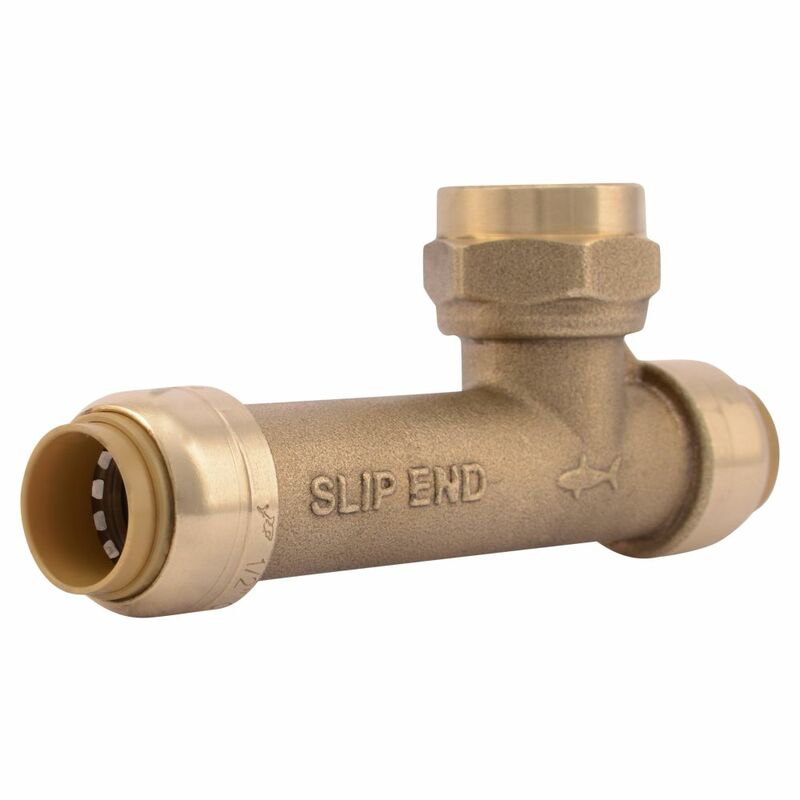 The Slip tee allows for the fitting to be inserted onto the pipe and then using the disconnect tool slipped back onto the other end of the pipe. This allows for up to a 2 in. section of the pipe to be removed and then repaired without having to add additional pipe. This slip tee is perfect for removing a section of pipe and adding in an expansion tank for your water heater, the FNPT Tee is threaded so you can screw in the Expansion tank after installing the tee to the line. Sb Tee Female Centre 1/2 Inch Fnpt Slip Rt Lf is rated 5.0 out of 5 by 3. Rated 5 out of 5 by Anonymous from Works great on new shower install. Would recommend to all. Works great on new shower install. Would recommend to all. Rated 5 out of 5 by William from i love shark bite plumbing connectors. this had some adjustment... i love shark bite plumbing connectors. this had some adjustment you can take advantage of when fitting in an existing line, very handy.